Udawalawe is one of the best places to see elephants in Sri Lanka - elephant lovers must visit this excellent national park! If beautiful beaches, delicious food, rich culture and stunning landscape aren’t enough to convince you to hop on a plane to Sri Lanka, then take a look at the amazing wildlife that this little island in the Indian ocean offers. 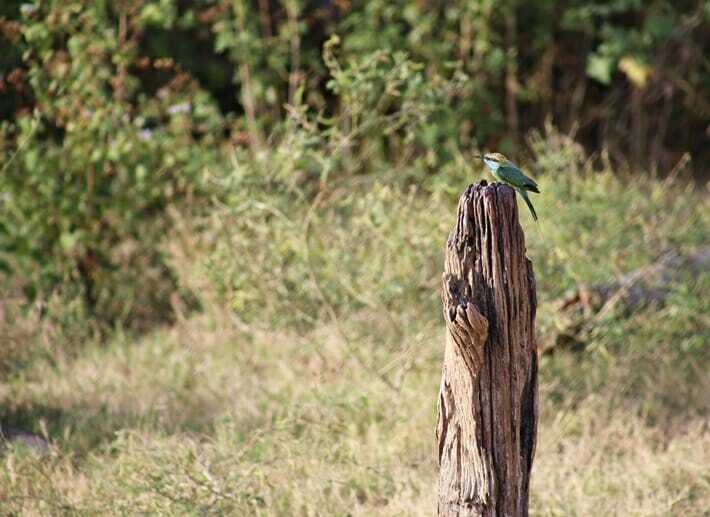 Despite its size, the country possesses an extremely high degree of biodiversity and is considered one of the top biodiversity hotspots in the world. Going on a safari in Sri Lanka is one of the best things to add to your itinerary. 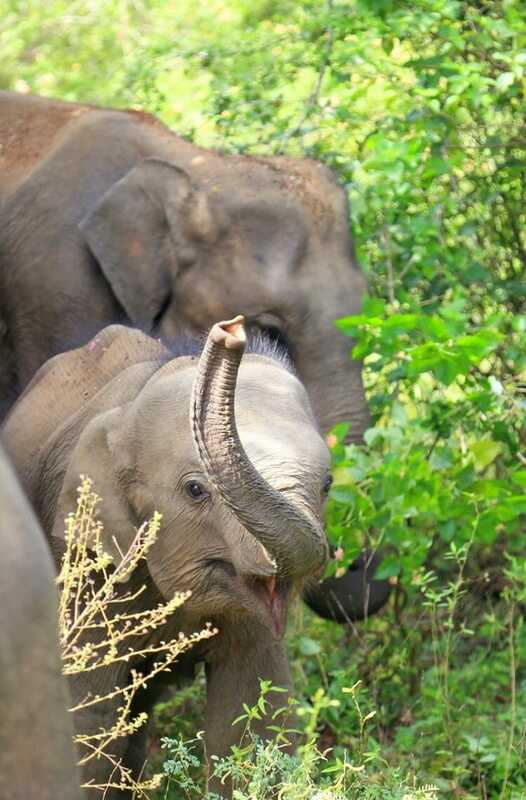 Love elephants and wondering where to see elephants in Sri Lanka? 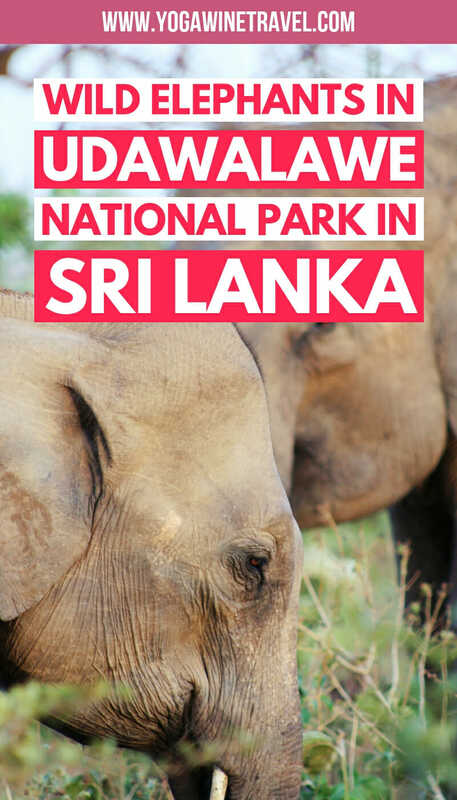 Go on a wildlife safari in Udawalawe National Park where hundreds of elephants roam free – read on for everything you need to know to help plan your Udawalawe National Park Sri Lanka safari! If you are visiting Sri Lanka (and especially the Southern Province), then chances are that you are weighing up between a safari in Yala National Park or Udawalawe National Park. 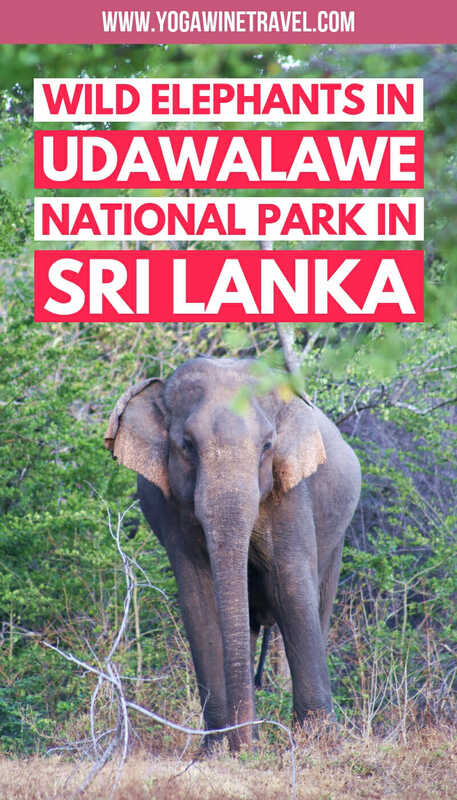 Both are fantastic and within a few hours’ drive of each other, but Udawalawe is popular among those who want guaranteed elephant sightings; Udawalawe is also about a third of the size of Yala and typically less crowded. Most importantly, Yala National Park closes for 6-8 weeks each year, typically from the beginning of September onwards – this means that all safaris in the Southern Province of Sri Lanka are rerouted to Udawalawe National Park. Here’s what you need to know before your elephant safari in Udawalawe National Park! Why should I visit Udawalawe National Park? Udawalawe National Park is located in the south of Sri Lanka and is a popular destination for those hoping to spot wild elephants. 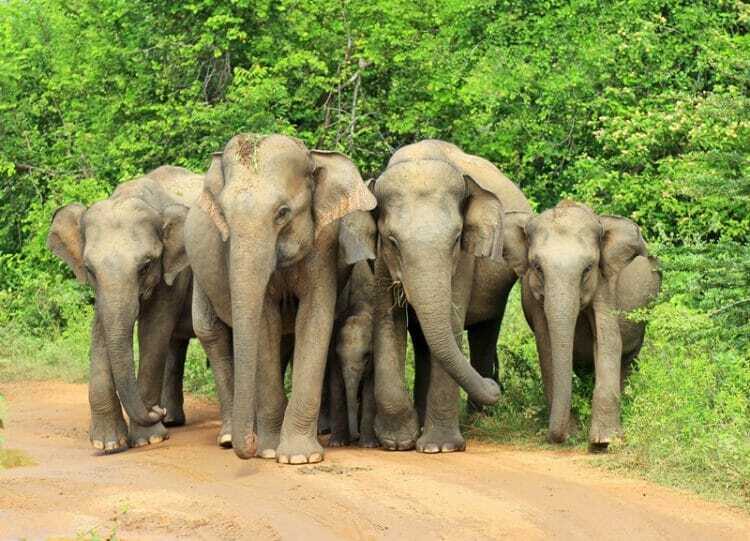 It is quite possibly the best place in Sri Lanka to see elephants throughout the year as there are a few hundred elephants within the park, and you can sometimes witness a herd of females moving or bathing together in the wild. According to the World Animal Protection Organization’s Research Report on the conditions for elephants used in tourism in Asia, Sri Lanka has the highest density of wild Asian elephants worldwide: an estimated five to six thousand in the wild and 120 to 200 in captivity. I would argue that Sri Lanka is one of the top destinations in Asia if you want to see an elephant in the wild, as Sri Lanka has done a wonderful job of protecting its wildlife while also making it accessible to visitors. 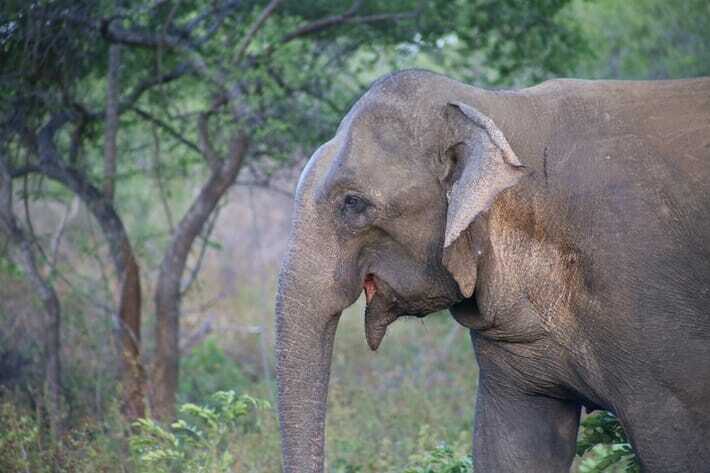 There is no better place to observe an animal than in its natural habitat, and I would highly recommend visiting the national parks in Yala, Udawalawe, Kaudulla or Minneriya over visiting one of the elephant “orphanages” in Sri Lanka (with the exception of the Elephant Transit Home which returns elephants to the wild). How do I get to Udawalawe National Park? The best way to get to Udawalawe is by car. If you are traveling from Colombo to Udawalawe be prepared for a 4-5 hour car ride. 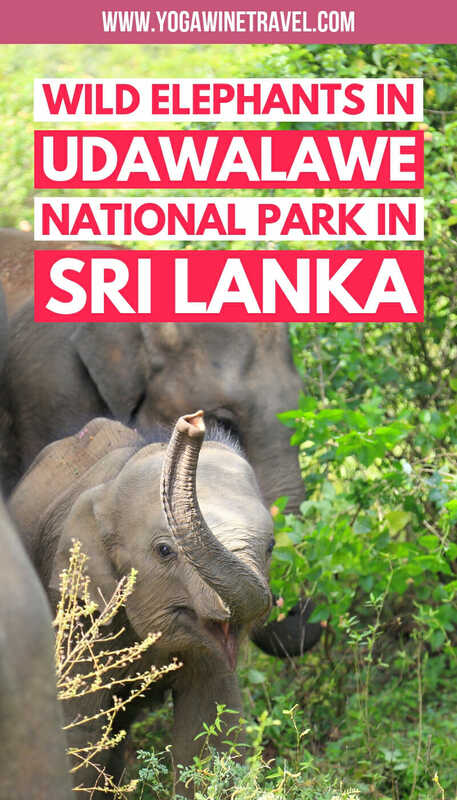 The first time I visited Udawalawe National Park, I booked my safari the night before through my hotel, and the rate for a 3 hour safari was 4500 Sri Lankan Rupees (approximately 30 USD). The second time I visited, I went as a day trip from Talalla Retreat and went with Niluka Safari. The 3 hour safari was just a smidge more than what my hotel charged – 5000 Sri Lankan Rupees. 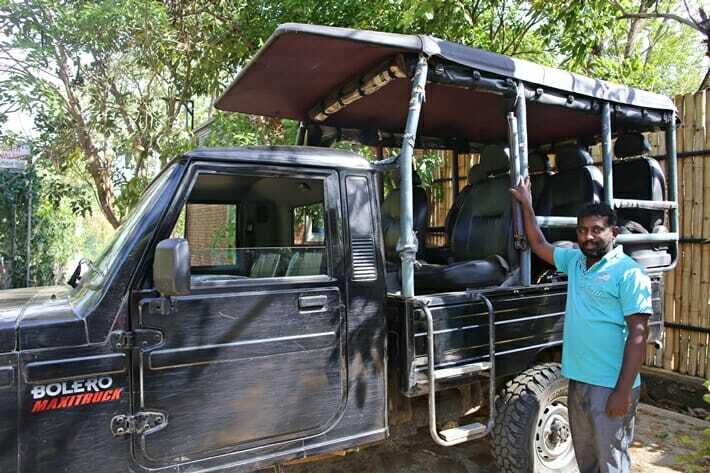 In addition to the jeep charges you will have to pay an entrance fee to the park itself; as of August 2017 the rate was 4400 LKR / 1 person, 7000 LKR / 2 people, 9580 LKR / 3 people. The per-person fees continue to go down as the size of your group goes up. Tips are discretionary. I tipped my driver/spotter $10 USD as I had an amazing time and he was incredibly knowledgeable about the animals and the park. 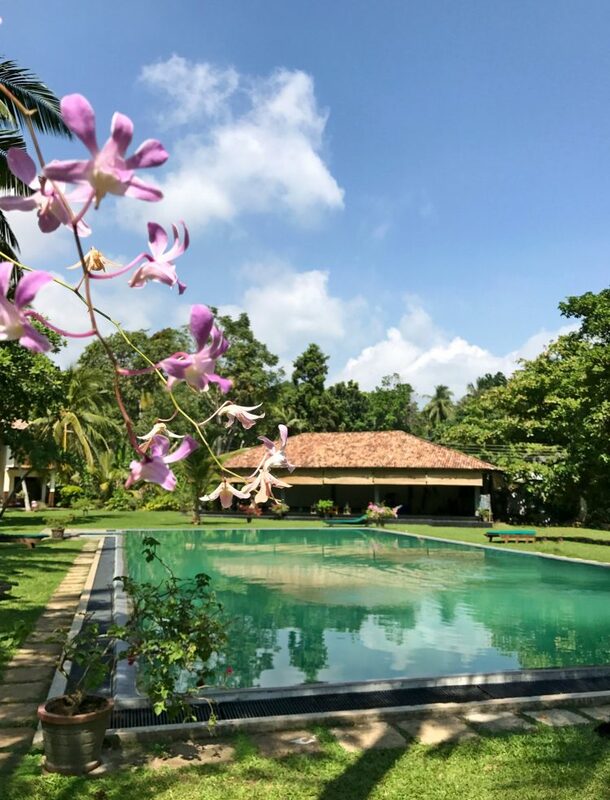 There are plenty of Udawalawe National Park accommodation options: I booked myself into Eliyanth Udawalawe, a small hotel that offered incredible value for money. The rooms were spacious and clean with a private balcony overlooking the river, the safari jeep driver/spotter was professional and could spot an eagle a mile away, and the manager went out of his way to help me arrange all of my transportation to and from the hotel. From my hotel it was a 30 minute car ride from door to door, and within 5 minutes of being inside the park we spotted a herd of 4 elephants! The one thing to note is that they only accept cash, but there are nearby ATMs that you can use. Click here to book your stay at Eliyanth Udawalawe or click here for some other accommodation options in Udawalawe! Booking tip: Not 100% certain of your travel dates? Choose a hotel that offers a flexible cancellation policy on Booking.com – click here for more accommodation options and current rates in Udawalawe! 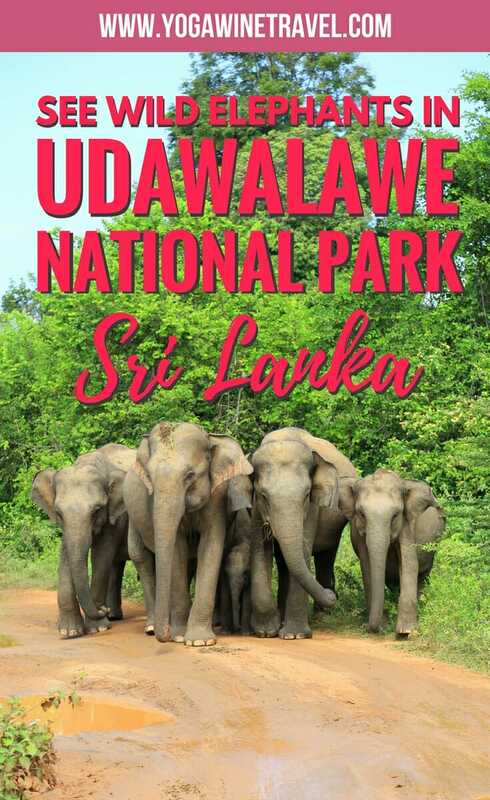 What hotel should I stay at if I’m only visiting Udawalawe National Park for a day trip? 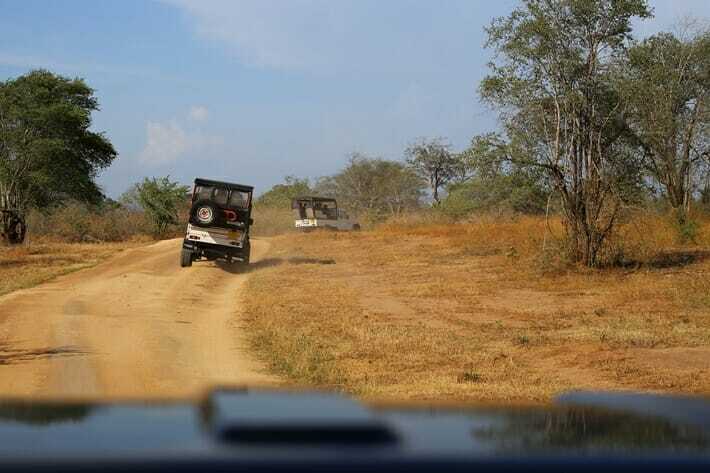 If you aren’t staying overnight in Udawalawe and only have time for a day trip to the national park, your best bet is to stay in the Southern Province – but get ready for a long day ahead of you as the drive to and from the park can be 2-3 hours long. However, the southern coast in Sri Lanka has beautiful stretches of beach and you have tons of options for places to stay! 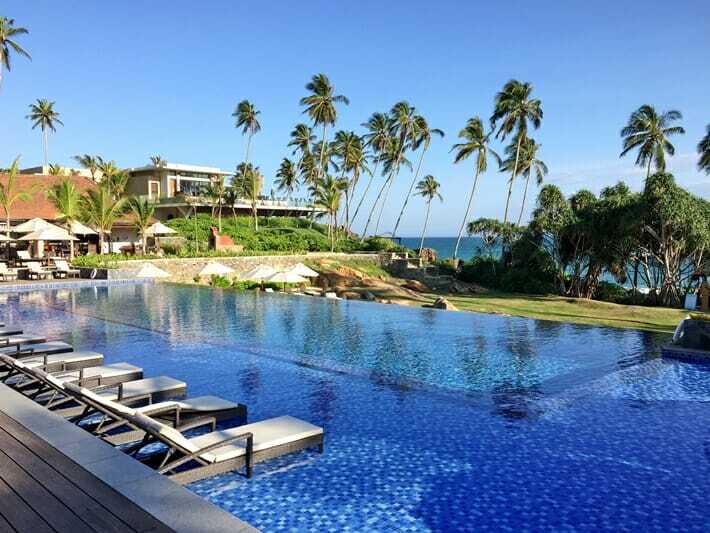 Shangri-La’s Hambantota Resort & Spa and Anantara Tangalle are excellent five star properties with amazing restaurants and service in this area. 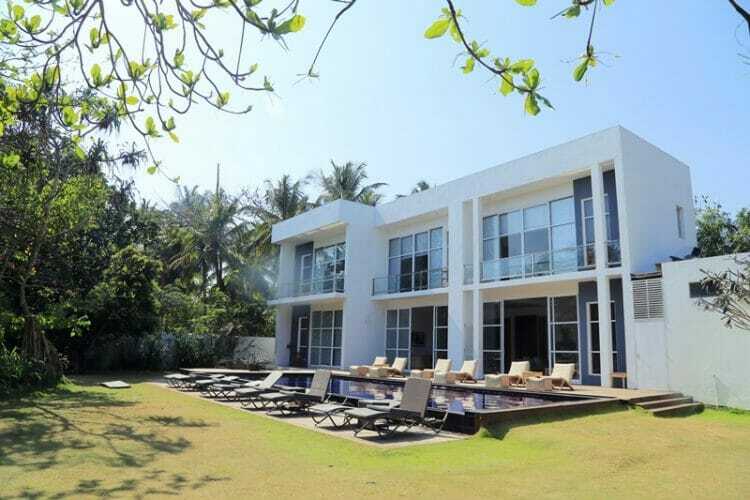 If you’re looking for something more low key, check out Talalla Retreat, the perfect place for surf and yoga or Zephyr Talalla, a beautiful boutique 4-bedroom beachfront villa serving up the best food & cocktails. All of these hotels are within 2-3 hours’ drive away from Udawalawe National Park. 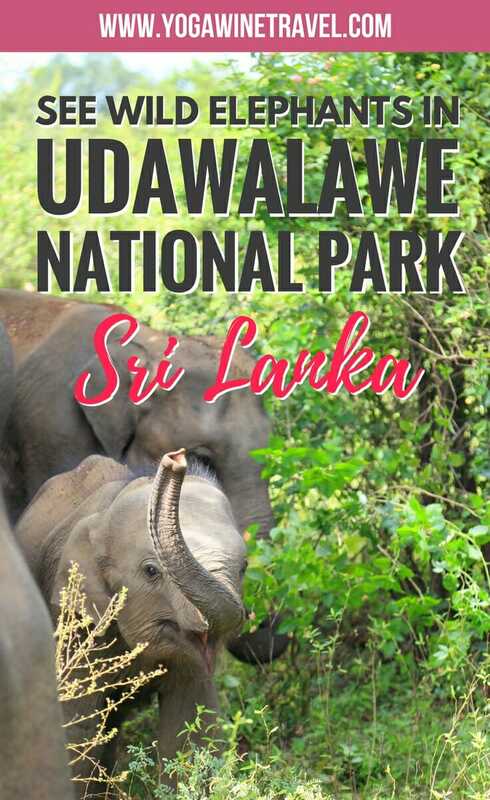 When should I visit Udawalawe National Park? 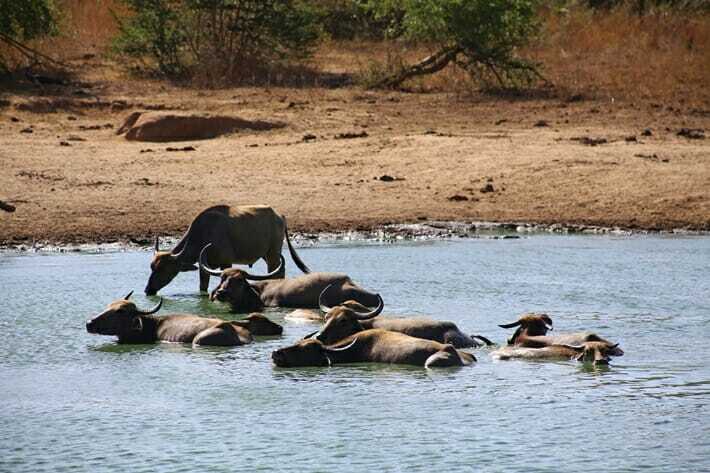 Udawalawe is in a hot, semi-arid environment and the annual average temperature is about 32 degrees Celsius. 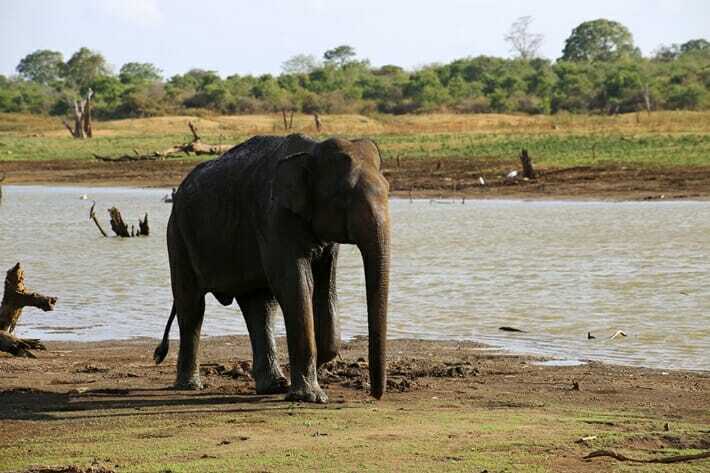 The chance of witnessing a herd of Sri Lankan elephants is extremely high near rivers and the reservoir of Udawalawe, and this chance increases during the dry season when the elephants gather near bodies of water. The dry season of the region is between May and September. However, don’t worry if you don’t time your trip for the dry season because your chances of seeing elephants during the rainy season are fairly high too! During my second trip to Udawalawe I visited during April, and there were tons of baby elephants as mating season is during the wet season. 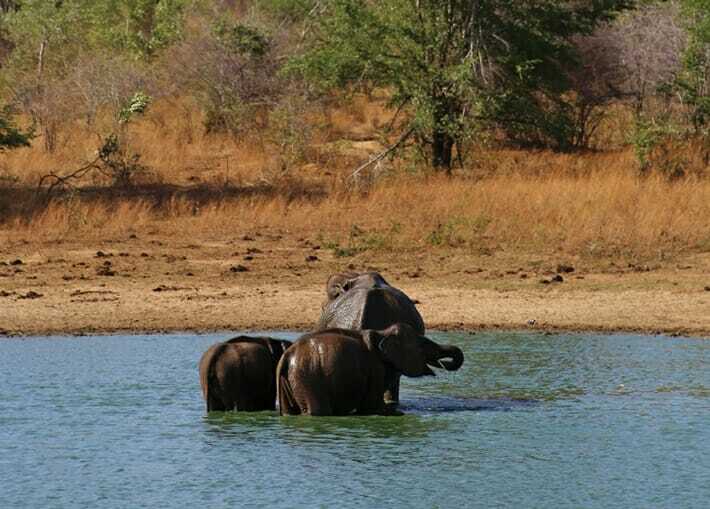 Although you might see elephants on a morning safari (I’ve seen 30-40 during a 3 hour morning safari), you’re better off going on a 3-hour afternoon safari from 3 to approximately 6 pm as many elephants will venture out to the river for a bath and sip of water. As I mentioned above, Yala National Park is closed to the public from early September to mid to late October each year, so if you are visiting southern Sri Lanka during this time you should head to Udawalawe National Park instead. What can I expect from a wildlife safari in Udawalawe National Park? Once you get to the park, you’ll be driven to the ticket office where you need to pay the park entrance fee. If you don’t have any Sri Lankan Rupees on you the office also takes Visa or Mastercard payments. Occasionally you will have a driver and a separate spotter, who is tasked with keeping an eye out for birds, elephants, crocodiles and monkeys. In my case, my driver was the spotter and had 20/20 vision – it was incredible! He would point out faraway animals to me and sometimes it still took me a while to see what he saw, even through my 300 mm zoom lens. The drive through the park can be bumpy and rough and it’s not uncommon for jeeps to be vying for the best spots when an animal is spotted. You are not allowed to drive up close to the animals or harass them, but I’m sorry to say that some drivers blatantly chased elephants through the park so their guests could get a better photo – don’t be that tourist! During my time in Udawalawe National Park I saw a small herd of elephants as well as approximately a dozen single elephants (male). One of the most memorable moments of the safari was when we ventured away from the other jeeps and stumbled upon one lone male elephant. 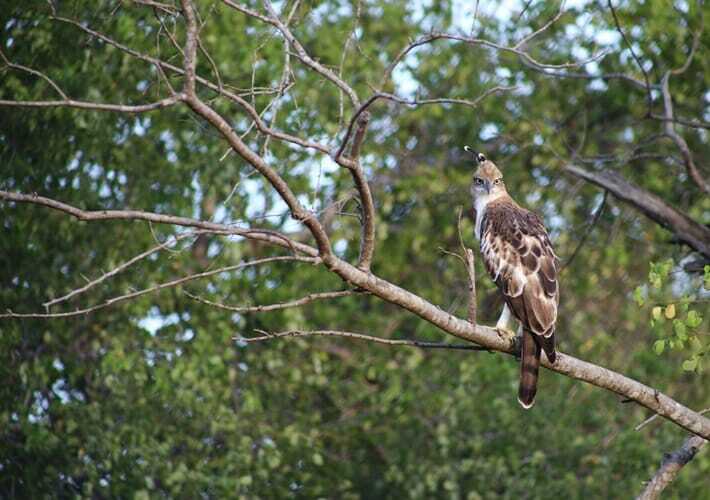 We watched him, silently, for approximately 20 minutes as he walked back and forth gathering leaves – he even reached up high for leaves from a tree! In addition to the dozens of elephants we also spotted kingfishers, tons of crocodiles, eagles, buffalo, peacocks and 1 monkey. Udawalawe National Park is an amazing destination for wildlife photography. Bring a camera and zoom lens (75 mm-300 mm or even more zoomed in if you have one), you’re unlikely to get any good shots using your smartphone. Cash for the park entrance fee – bring Sri Lankan Rupees as they don’t accept US Dollars. They also accept Visa or Mastercard. You shouldn’t need sunscreen as most jeeps are covered at all times – there is one spot where you’re allowed to step outside of the vehicle but that area is also shaded. A hair tie or cap as the drive can get extremely dusty, I felt like I could crack my hair in half by the end of the safari. Which national park is better? Udawalawe or Yala? 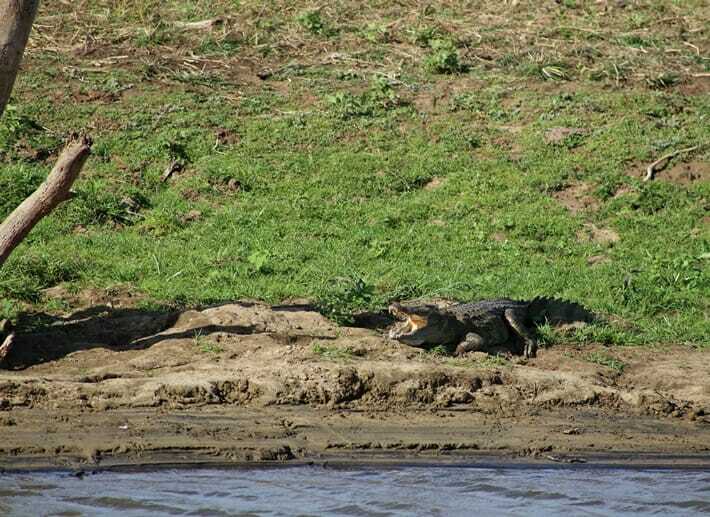 As both national parks are in the Southern Province, many people find themselves debating whether to visit Udawalawe or Yala National Park – which safari in Sri Lanka you go on depends on several factors. I’ve been to both, and I can wholeheartedly say that they are different enough to warrant a visit to both. If you only have time for 1, then you’ll have to decide what animals you’re hoping to see. If you’re desperate for a chance of spotting a leopard, then Yala National Park is your best bet as it boasts one of the highest leopard densities in the world. Like all safaris though, a sighting is not guaranteed – I’ve been on three safaris in Yala and have yet to see a leopard. 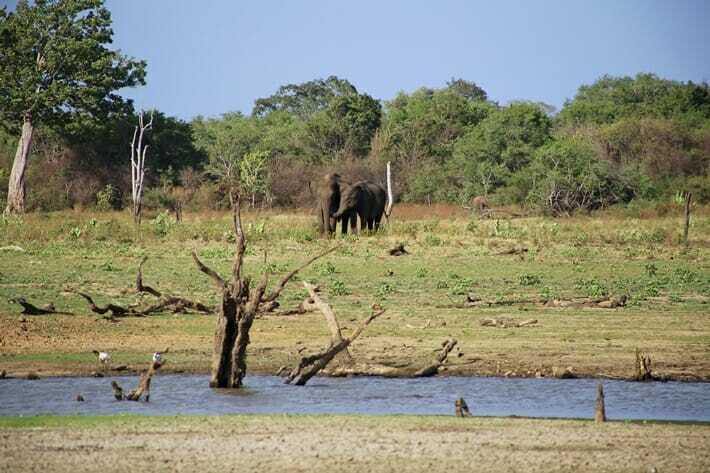 You are also likely to see a few elephants, though not as many as if you were to visit Udawalawe National Park as it is three times the size and animals are more spread out. Udawalawe does have leopards (an estimated 1 dozen or so) but the chances of spotting one are extremely rare. 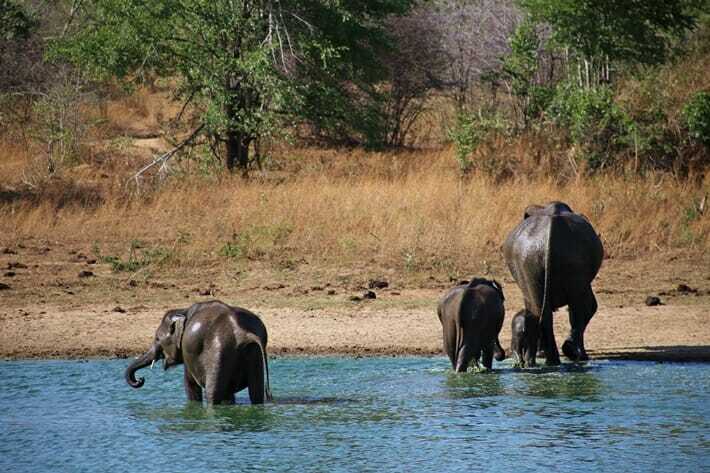 If you’re an elephant lover and want a guaranteed sighting of a wild elephant, then I would say head to Udawalawe National Park; in general, the number of people and jeeps in Udawalawe tends to be lower so the park is much less crowded. The pricing at Udawalawe tends to be less than that of Yala National Park. 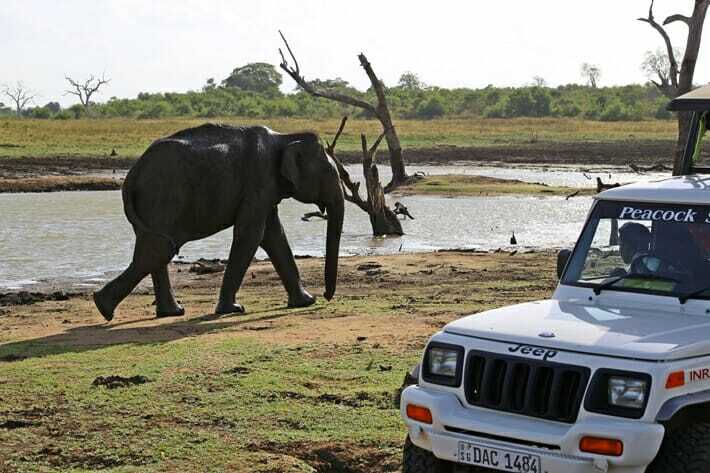 It costs approximately 11,500 LKR (75 USD) for a safari for 2 at Udawalawe depending with which company you go with, whereas the pricing for a 2-person safari at Yala is closer to 23,000 LKR (150 USD) and upwards. 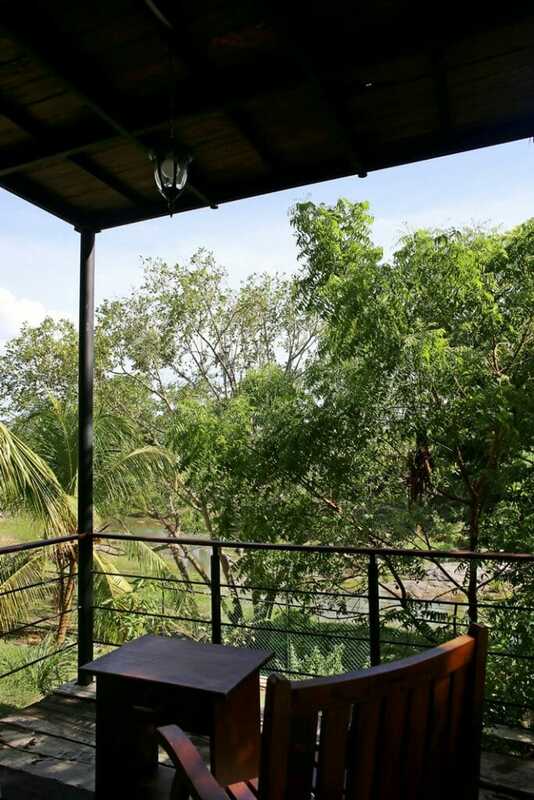 Planning a trip to Yala National Park instead? Click here for my guide to going on a safari in Yala! Nothing excites me more than checking out elephants in their wild habitat. Matter of fact, had it not been because of your blog post, I would have assumed that elephant in Sri-Lanka are mostly in captivity and mainly used to entertain tourists. On the contrary! Sri Lanka has done a great job of protecting their national parks and wildlife. Unfortunately there ARE elephants in captivity in Sri Lanka as they are used for religious festivals, but hopefully one day that will change. I’m planning Srilanka for next year. The little island is indeed filled with so much of beauty both in nature and heritage! Those elephants look so adorable! Eliyanth hotel looks decent, esp with the river view balcony, its just perfect! There are so many incredible national parks – Yala, Udawalawe, Minneriya, Kaudulla and more. You’ll love it! Sri Lanka is definitely on my bucket list to visit next year. Thank you so much for this as it gives me ideas to visit lovely places like this. Hope you get to visit soon! It’s an amazing country. Thanks for taking the time to read this, Mina! Quite amazing! I have never been to a safari, and it seems like such an experience! Thanks for the post, it is very informative. It’s a lot of driving around on bumpy roads, but when you do spot an animal in its natural habitat it’s pretty darn breathtaking! That’s what I’m all about – hopefully one day there will be none in captivity! Are teh elephants tame at all? There is not one single image of a bull elephant charging at you, ready to tear you to pieces! They don’t tend to charge towards humans unless you’re aggravating them – have you seen that in the past? I can imagine that this would be an incredible experience for kids! Sri Lanka is on my list. As a real safari lover (I never thought of making a safari in Sri Lanka, I always look for African destinations), I will definitly keep this one in mind. There are some incredible safari opportunities in India as well – there are Asian lions, tigers and leopards. I have never been to a safari, but it seems so exciting. WOuld have never thought of Sri Lanka as a safari destination. There are tons of national parks scattered around Sri Lanka – it’s amazing! Wow this looks like a dream come true!! Sri Lanka is really high on my list and I have been researching different national parks and safaris so this is so so helpful! That place you stayed looked so dreamy too! 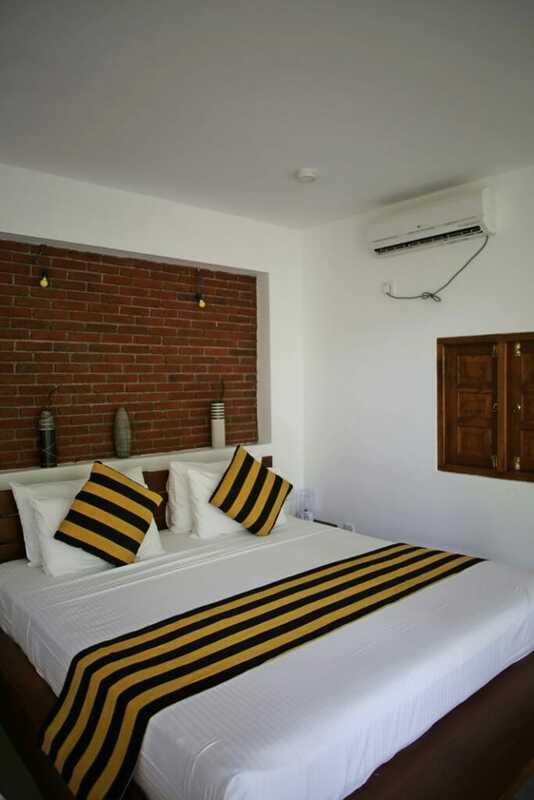 The accommodation was super basic but the rooms are clean and spacious. The best thing is that they’re super close to the national park entrance! I had no idea Sri Lanka was such an elephant hot spot! I’m definitely going to have to add this to the bucket list and save this post. I love how organized and detailed everything was, I could definitely plan an awesome trip with this information! Thank you!! I hope you get to go on a safari in Sri Lanka soon! That looks like a stunner of an Elephant safari and whem i finally reach Sri Lanka, I have to put it on the list because it truly looks magnificent to see these wild elephants in the fleah. The adventure looks a treat by judging by the pictures and there even seems to he decent accommodation. Gteat post plus pics. Thanks for checking this out, Anthony! I hope you find it helpful in planning your safari experience in Sri Lanka. The parks look very nice and it is incredible that, that many elephants can be found in one place. To be able to see all of these animals in one place roaming around is remarkable. This makes me excited for our safari in Africa in 2 weeks. Wow! This looks amazing. This is exactly how I would like to see the elephants; where they roam free in the nature and aren’t exploited. I also always wanted to visit Sri Lanka. It looks beautiful. They’re so happy and free in the wild – it really is a sight to behold! Beautiful post and experience – great that focus is put on the wellbeing and care of the elephants, and that elephants can be observed in their natural habitat without interference from tourists – just as it should be! I visited Kaudulla national park back in 2015 which was pretty good – it was a safari style drive and we got to see elephants gathering around water hills at sunset. Magnificent! 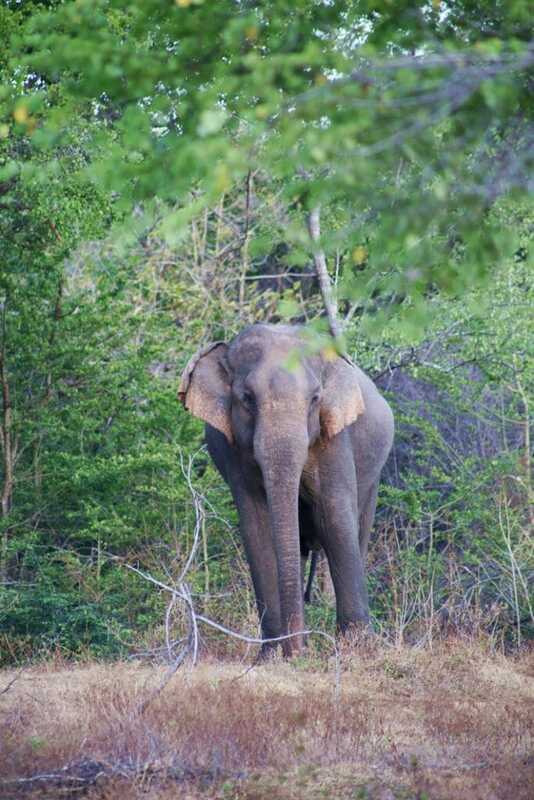 Kaudulla is great for elephant spotting as well – we were just there for “The Gathering” and I’m hoping to write that up soon! I love elephants!! This is a great post and your photos are amazing! I would love to go on a safari one day and this one looks perfect! They are such incredible, beautiful, majestic creatures! I went on this exact tour when I was in Sri Lanka. 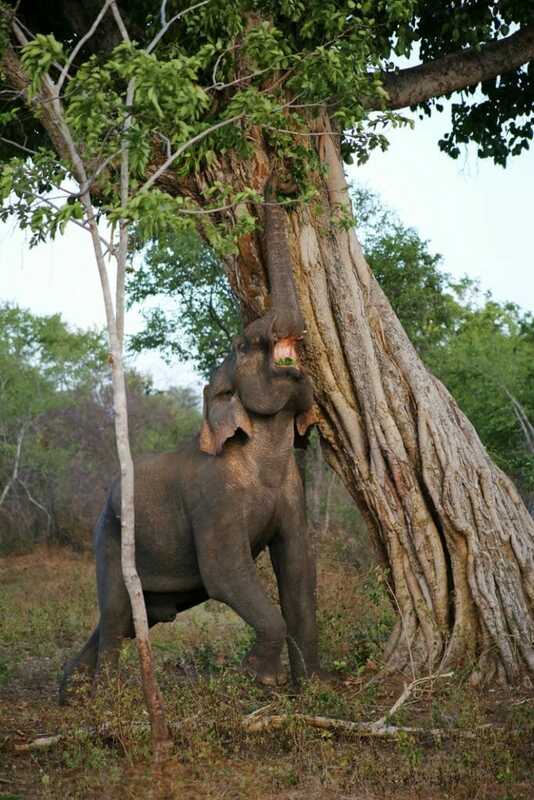 In Udawalawe National Park I went searching for animals and was lucky like you to see wild elephants. I also had lovely weather like you which meant for amazing photography. So much sunshine and no haze – perfect safari day! This looks like a much better alternative to visiting one of the Orphanages – so sad the treatment of Elephants across asia! A lot of work needs to be done. 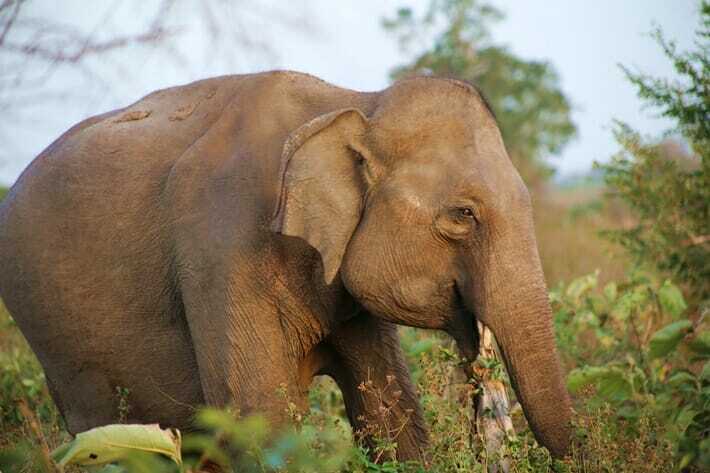 Sri Lanka has done a fantastic job protecting their wildlife – hopefully one day there will be 0 elephants in captivity! Udawalawe National Park sounds like utter perfection. I love all animals, but elephants hold a special place in my heart. They are so beautiful and majestic and I would love to watch them in their beautiful natural habitat. One ofr my bucket list I think! I hope you get to visit one of Sri Lanka’s many national parks soon, Sam! Thank you so much for taking the time to read this Madhurima! 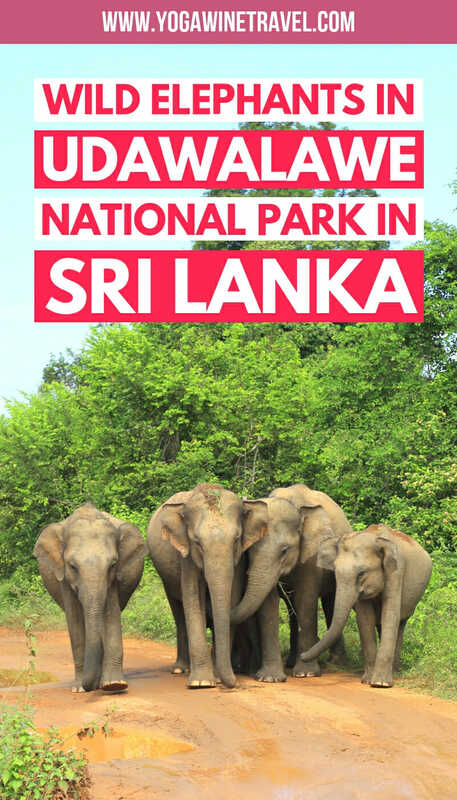 What a comprehensive overview of Udawalawe National Park! I know Sri Lanka was a prime spot for wildlife, specifically elephant watching and I cannot thank you enough for promoting mindful values in your travel posts! I hate the rampant animal abuse that tourists participate all for the sake of a perfect picture! Great trips and if it were me, I’ll take Udawalawe over Yala any day! Thanks so much for taking the time to read this, Izzy! My hope is that the issue is one of a lack of awareness, rather than choosing to contribute towards animal abuse. Hopefully one day everyone knows the impact of their travel decisions! 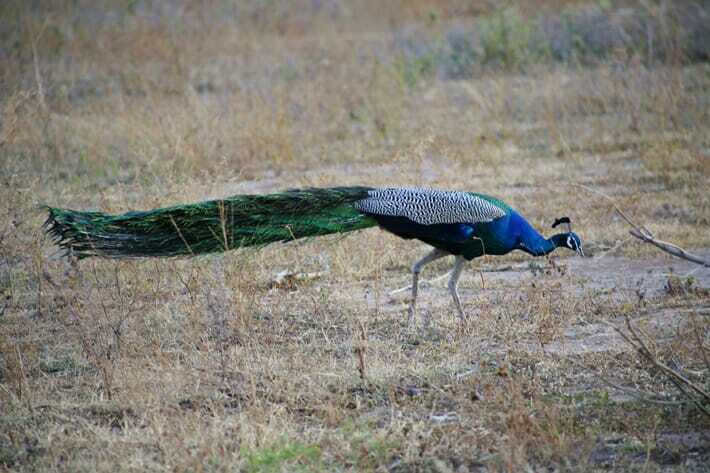 We are planning to do a safari in Udawalawe, and one in Wilpattu. Do you believe that 3 hours is enough for Udawalawe, or should we plan for a 6 hour visit? We would start very early in the morning (6h00 am). Hi there, my understanding is that you have to exit the park after 3 hours, and re-enter in the afternoon. I would recommend that you do 2 x 3 hour safaris in Udawalawe rather than a 6 hour safari, especially if you’re hoping to spend some time observing the elephants. Have a great time! Udawalawe national park is an absolute must for Sri Lanka visitors. 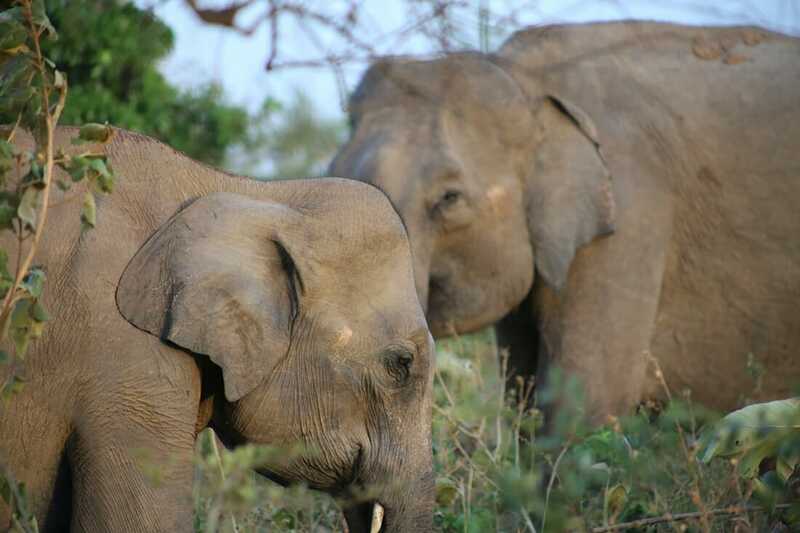 The experience felt once in a lifetime; elephants (even as young as two months old!) roamed the land along with beautiful birds, reptiles and monkeys. Thanks so much for the post. There will be 4 of us visiting next month and I think we will take your advice and stay at a camp near the park entrance. 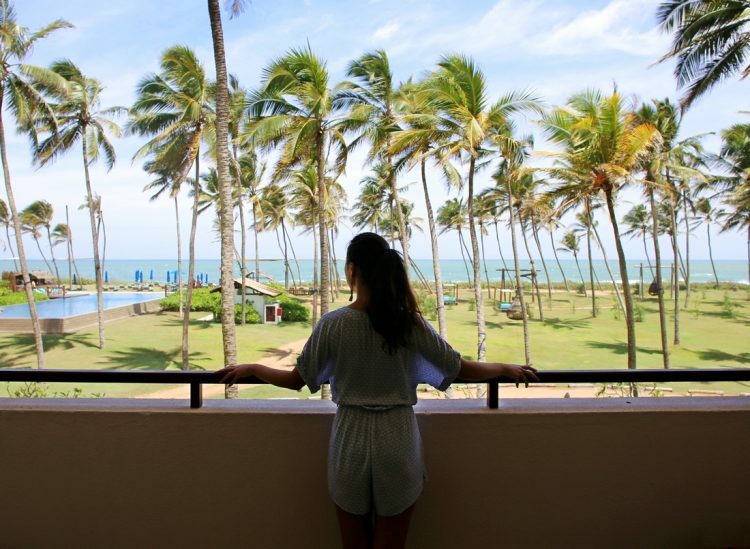 I definitely think that we should stay there the night before we safari, but would you suggest staying there again after, or would it be reasonable to head to Tangalle after the afternoon safari? Just curious what the day looks like if we do 2×3 hour safaris. Thanks! !